Oh, and, by the way, she also chimed in that leprechauns were shoemakers, not the magical elves that became associated with the holiday. What’s not a myth is that St. Patrick’s Day arrives at the perfect time of year. The official start of spring is only days away and we’re ready to lighten up, so it makes sense to start with Irish whiskey, right? They rarely gets too beefy, even those with extensive oak maturation. Speaking of, there are some fun new ones on the market this year that have spent some time hanging out in interesting casks. Greenspot Château Léoville Barton: Here’s the first in the Spot label’s ‘Wine Geese’ series, which is a play on the nickname ‘Wild Geese,’ given to Irish soldiers who left Ireland to fight in other countries across Europe in the 16th - 18th centuries. The wine part comes into play with Thomas Barton, an Irish man, who was also known as ‘French Tom,’ who founded the Léoville Barton estate in Saint-Julien, Bordeaux. The pot still whiskey was first matured in a combination of ex-bourbon and ex-Oloroso sherry casks before a final rest for 12 - 24 months in French wine casks from that estate. The resulting whiskey is delicately floral and with an abundance of ripe berry notes, with a finish that’s reminiscent of buttery pastry dough. Like a good wine, this would be a very food-friendly whiskey, especially with a hunk of Irish cheddar cheese. 46% ABV, $100. Tullamore D.E.W. 15 Year Old Trilogy: The power of three is a prevailing theme for the brand. Along with triple distillation, their expressions incorporate all three types of Irish whiskey - pot still, malt and grain. This release, the work of malt master Brian Kinsman, takes that theme even further with triple cask aging that starts in ex-bourbon barrels, then Oloroso sherry butts, with a finish in ex-rum casks for a total of 15 years of maturation, the oldest release they have done to date. The flavors balance between fruity and earthy, with ripe berry and cherries, candied almonds, walnut and green tea. The perfect after dinner dram. 55% ABV, $80. Midleton Dair Ghaelach: The name is Gaelic for Irish oak. The blend starts with 15 to 22 year old single pot still whiskey that is given an unprecedented additional finish for nearly a year in Irish oak hogshead casks from Grinsell Woods trees grown in Ballaghtobin Estate in Co. Kilkenny. 10 trees were used to create the casks, with their corresponding numbers indicated on each label. Therefore, flavors and ABV may vary slightly from bottle to bottle depending on the tree. The sample tasted for this review had a honeysuckle sweetness and a good dose of vanilla mixed with pear, tart apple and an interesting funk of toasted sesame. At cask strength, the flavors can be a little tight, and this dram greatly benefits from a drop or two of water or an ice chip to relax it a bit. For $270 a pop for a bottle, you might want to find a place with a good Break Even Program to experience it. 58% ABV. 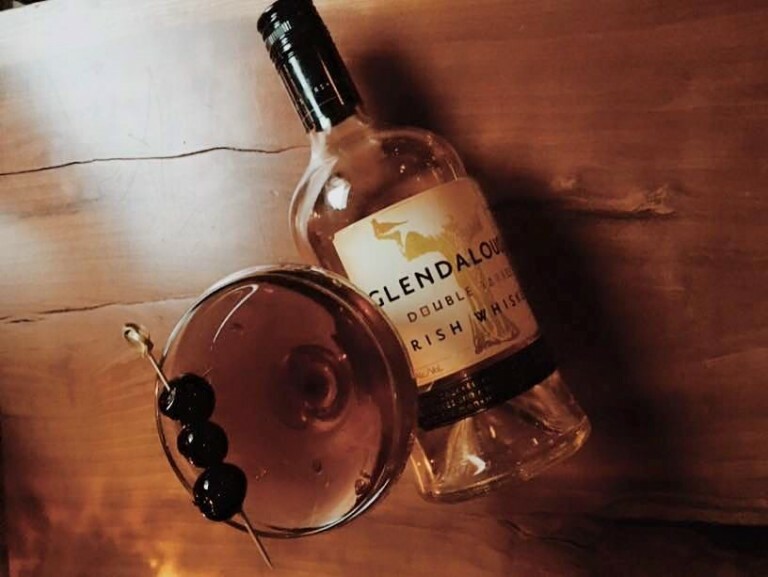 Glendalough Double Barrel: Glendalough prides itself on being Ireland’s first craft distillery. Having entered the market with some impressive versions of poitín (unaged or lightly aged pot still whiskey), this more mature expression is made from a mash bill of malted barley and corn that is produced in traditional Irish Coffey stills. It spends 3.5 years in ex-bourbon casks, then an additional 6 months in ex-Oloroso sherry casks. Who’s the guy on the label? That would be St. Kevin, an Irish monk known for his fierce independent streak. The sherry casks lend a fair amount of tart, dried fruit and nutty characteristics to this whiskey. It’s somewhat sharp with an alcoholic bite, but is quite sippable on the rocks. It would make a fine base for cocktails such as a Whiskey Sour. 42% ABV, $35.